Today is our first reveal for our February Release and we are featuring the set Naughty Newton! We are giving this set away to two lucky winners so make sure you read all the way to the bottom of this post to see how to win! Our namesake kitty, Newton, is up to no good in this 4 x 6 stamp set! He’s doing all those naughty things cats do: He’s knocking over the plants, unrolling the toilet paper and scratching things! This is must have set for to create funny cards for cat-lovers! You can also use it for get well cards or to say “I’m sorry” in the most adorable way. Don’t worry - “Naughty Newton” is so cute we can’t stay mad for very long! Check out all the amazing projects below from our Design Team and Guest Designers, Simon and Angel! Then, make sure to click through to all their blogs for details on their cards - Some of the designers have extra cards on the blogs and you might even find a fun video or two along the way! Make sure to comment for a chance to win! Details on the giveaway are at the bottom of today's post. Our February Guest Designer Simon Hurley, created this fun card with kitty scratching up the card! Love the addition of the fun buttons to this sweet and simple layout! 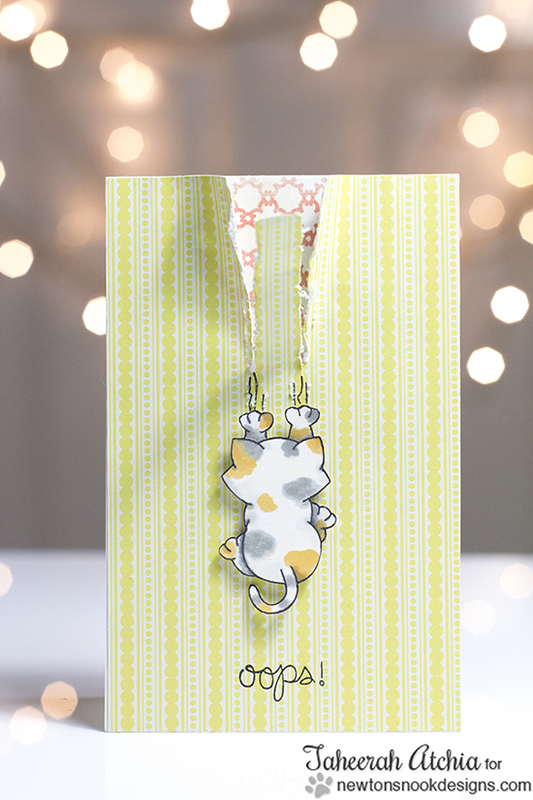 Our other awesome Guest Designer Angel Rivera created this card - I love the mix of chevron and polka dots - plus that coloring on the kitty is so pretty! Isn't the watercoloring on this card by Stephanie so pretty? I love the soft colors she used for the card background too! Here's a cutie by Samantha - she combined our naughty kitty in the toilet paper with Winston from the Boo Crew stamp set! Such a fun idea!! Check out her blog for a second fun card today too! 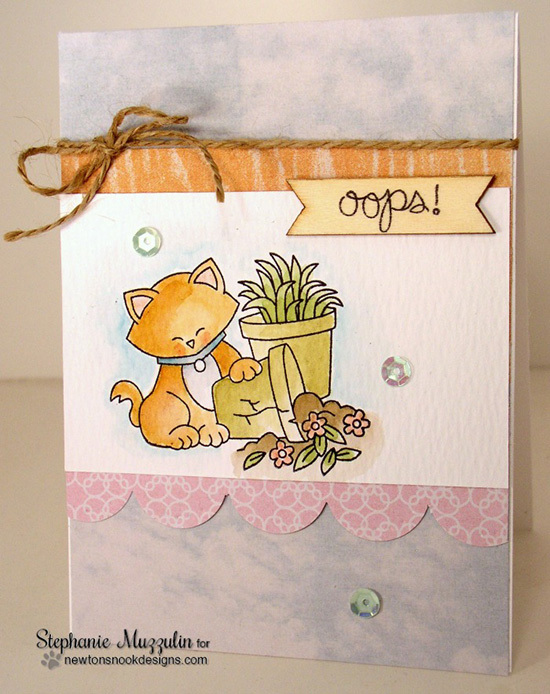 Here's an adorable card by Larissa- I love how she created the kitty clawing the chalkboard! 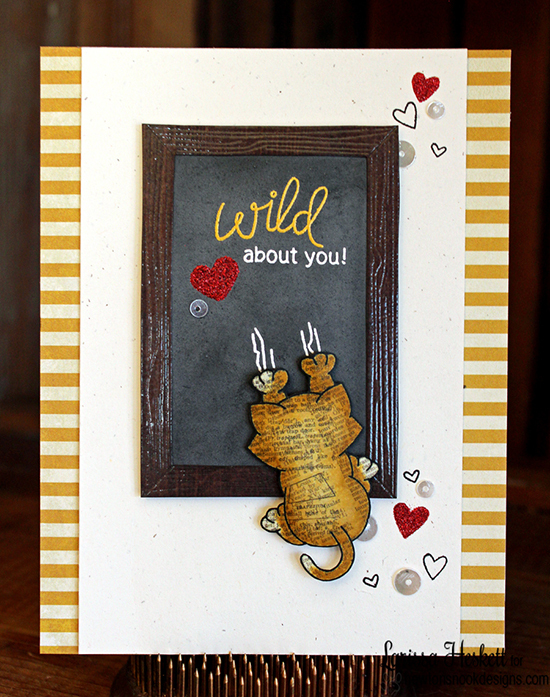 She used the wood frame from the Around the House stamp set and the "wild about you" from the Wild Child stamp set. 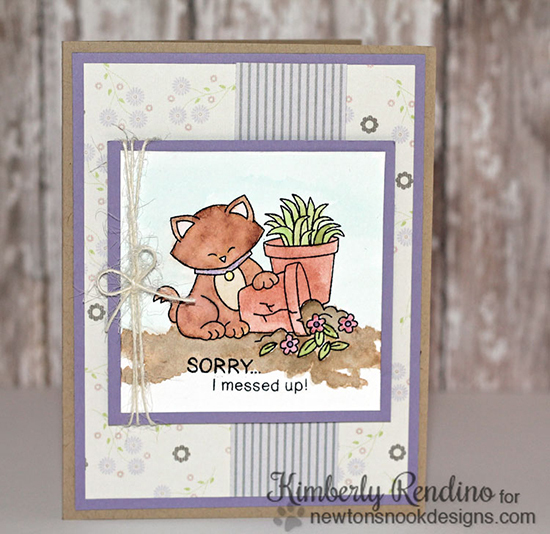 This card by Kimberly is so cute! That naughty kitty sure made a mess but how can we be mad at him? 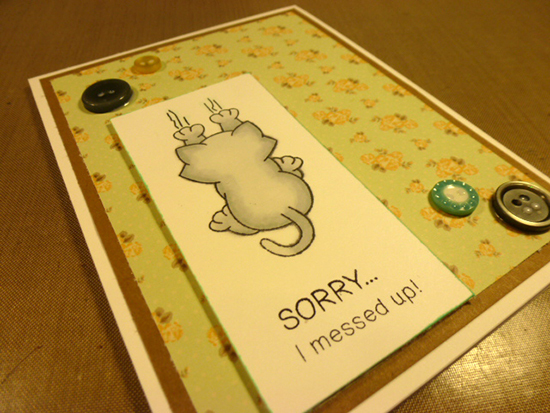 This card by Yukari is perfect for saying SORRY - who can resist that cut kitty tearing the paper? 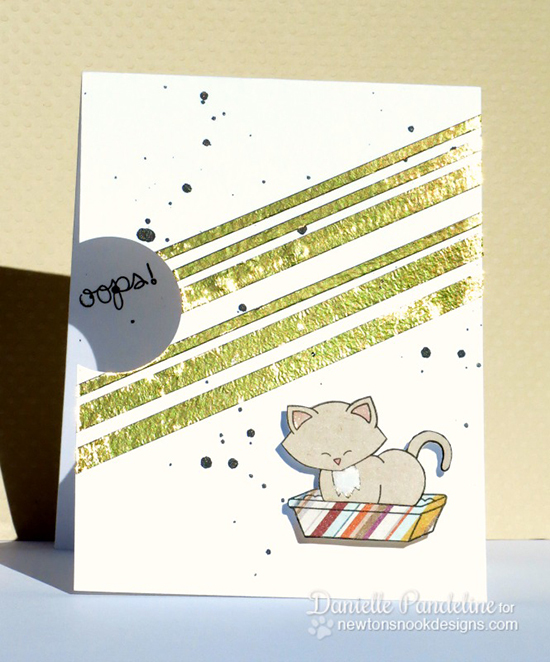 Danielle created this fun card with the kitty in the little box - isn't all that gold foil so pretty? 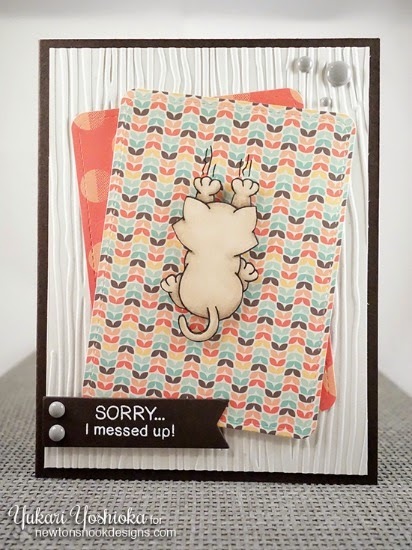 Taheerah created this naughty kitty card! I love the torn paper that the kitty has clawed! Adorable! This card by Lydia is STINKIN' CUTE! Love the bits of bling and the pink litter box! 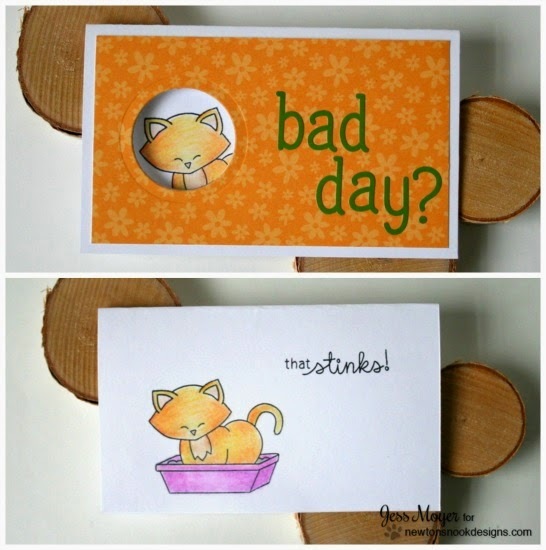 This card by Jess would make anyone smile - I love that you open it up to find the kitty in the litter box - so funny! Crafty Math-Chick created this creative little card - I love the fun tape background she created and the sentiment looks like it's on a roll of paper - so funny! Would you like to win “Naughty Newton”?This set will be given away to TWO lucky winners! Comment on the NND blog and Design Team and Guest blogs (see list below)! Two winners will be chosen at random from the collective blogs release posts. Make sure to check out each of their blogs and comment for your chance to win. You will not know which blog has been chosen so the more you comment on the better your chances are of winning! You have until Thursday, February 12th at 9pm CST to comment -- winners will be announced on the blog post on Friday, February 13th. Hahaha... These are fantabulous!!! This set went straight to the top of my wishlist!!! Wow this set I simply gotta have how cute is this. And all those great projects by the team, awesome. OMG this set is a must have!!! Oh you've caught the naughty spirit of those darling felines! I love the kitty litter stamp and That Stinks sentiment. (Velcro's nickname is Toxic and we have a big toxic poster hanging by the litter box!) The DT projects are amazing! Can't wait to get this set inky! Lovely cards Jen - you always find the prettiest papers & washi tapes! I love the grey stripes on Newton as well. !!!!!!!!!! This set is so cute!!!!! I love the torn "wallpaper" in Taheerah's card!! This set is simply adoreable. Ha ha...this set is so fun...love it and the cards are just great! Wow! Everyone's cards are amazing, great job ladies! And love your cards too Jen! We clearly have good taste in pattern papers ;)! Adorable! And brilliant ideas, designers!! Everyone's cards are fabulous!! Such an adorable stamp set!! Love it!! OMGsh, so stinking cute! This set is definitely a MUST have for my collection! This set brings back memories of my fur kids as kittens...thankfully they stopped playing with the toilet paper, but I never could break their bad habit of scratching on the carpet instead of their many scratching posts!! What a cute set and fabulous examples of naughty Newton! This set is so cute and fun! I love all the DT cards and GT cards they are lovely! this set is stinkin cute!!!! Wow! Some REALLY creative cards! Awesome! Love the images and love the cards -- especially the scratch cards -- hilarious! Super cute cards - love the images. Great blog hop and I love all the new release images! Great job by the DT too! Love what the designers have come up with- super fun new release! 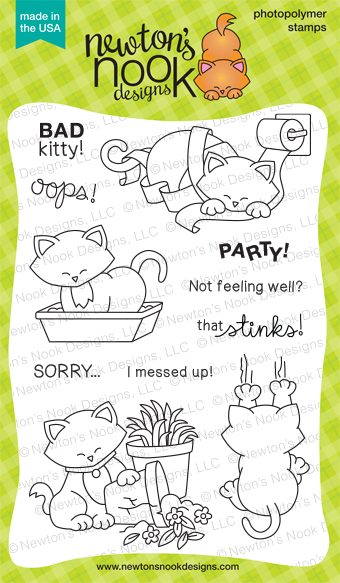 Love the fun Newton's Nook stamps!!!! Always adorable! OMGosh...I LOVE this new set!! Newton gets himself in so odd situations. Love it. The hop was great. I couldn't leave a comment at Simon's blog. Well I giggled all the way through the hop! What a fun set! Newton may be naughty, but I love him! Must have this set! Awesome job by your DT! Oh how wonderful! Reminds me of when my cats were little. Would love to win this. Precious stamp set. Newton gets in all kinds of trouble. Children would love these cards as well as animal lovers. This set is super cute!!! Although I love the bunny set I must have naught Newton! A great stamp set especially for cat lovers like me! So pretty, Jen! I love the one on the aqua card base! I love Naughty Newton!! Reminds me of things my cats do. The cards are so cute. I LOVE this set. The card by Larissa w/the kitty clawing the chalkboard and the card by Taheerah w/the torn paper that kitty clawed are my favorites. Super cute set, it's so much fun! ha ha ha!! this set just cracks me up SOOOO much!! i love it and i know everyone else is going to love it, too!!! these cards....best way to make someone smile, i'm SURE of it!! and your cards jennifer are incredible!! love!! Fabulous! This stamp set is too cute! Love it! OMG, these are PURRRRRRFECT!!!!!!!!!!! I have three cats of my own: Angus, George and Peepers...I adore cats and these cards are adorable!! Thank you for sharing and for the chance to win! love them! !